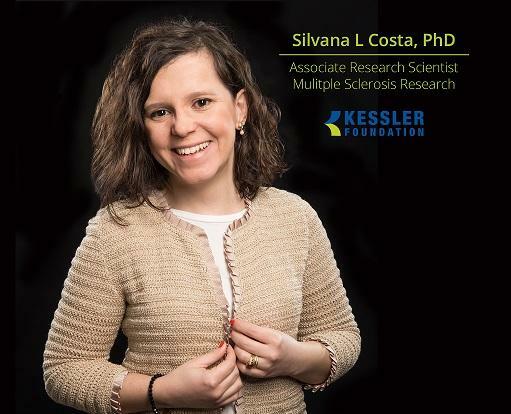 Silvana Costa, PhD, has won a $477,000 grant from the National Multiple Sclerosis Society (NMSS) to study the impact of visual, cognitive, and motor deficits on information processing speed in individuals with multiple sclerosis (MS). Dr. Costa is an associate research scientist in Neuropsychology and Neuroscience Research. She is a former NIDILRR distinguished Switzer Research Fellow, and was the inaugural Hearst Fellow at Kessler Foundation. MS is a prevalent and chronic neurologic disease and is the leading cause of disability among working-age adults. Individuals with MS often experience significant visual, cognitive, and motor impairments, which negatively impact overall quality of life. Information processing speed, which is defined as how quickly a learner can process incoming information, is the most commonly impaired cognitive domain in MS.
"The cause of processing speed impairment in people with MS is poorly understood," explained Dr. Costa. "This four-year study will examine visual, cognitive and motor functioning deficits individually, and then explore each deficit's impact on information processing speed. Understanding how these deficits make independent contributions to information processing speed will have significant implications for the way we conceptualize, evaluate, and rehabilitate this common impairment." This study will utilize both neuropsychological evaluations and eye-tracking technology. During neuropsychological evaluations, researchers will observe how participants with MS execute cognitive tasks such as reading. Eye-tracking technology will simultaneous record eye movement while participants execute the same task, providing additional insight into the individual's cognitive function. Kessler Foundation's cognitive rehabilitation research in MS is funded by grants from the National Institutes of Health, the National Institute on Disability, Independent Living, and Rehabilitation Research, National MS Society, Consortium of MS Centers, the Patterson Trust, Biogen Idec, Hearst Foundations, the International Progressive MS Alliance, and Kessler Foundation. Under the leadership of John DeLuca, PhD, senior VP for Research & Training, and Nancy Chiaravalloti, PhD, director of Neuropsychology & Neuroscience Research, scientists have made important contributions to the knowledge of cognitive decline in MS and developed new treatments. Clinical studies span new learning, memory, executive function, attention and processing speed, cognitive reserve, emotional processing, employment and cognitive fatigue. Research tools include innovative applications of neuroimaging, mobile devices, and virtual reality. Neuroimaging studies are conducted at the research-dedicated Rocco Ortenzio Neuroimaging Center at Kessler Foundation. Kessler researchers and clinicians have faculty appointments in the department of Physical Medicine and Rehabilitation at Rutgers New Jersey Medical School.